As a rule, at that certain time of the year (depending on your organization’s evaluation cycle), we all get the opportunity to reflect on goals. Whether it be the previous year’s or the upcoming year’s goals we tend to have a love/hate relationship with them. This is most likely because they are generally imposed on rather than proposed by the individual – but why is that? First, let’s take a minute to describe what we are talking about here. The Webster definition of “goal” is “the end toward which effort is made.” Oxford similarly defines a goal as the object of a person’s ambitions or effort; and aim or desired result. Now when we consider the development of goals, there are often two types. There are departmental goals which are, more often than not, some form of a regulatory or corporate compliance requirement. These tend to trickle down to the individual from some form of performance improvement goal established by the Environment of Care Committee as a method of ensuring regulatory requirements are met. This may find its way to into a Department Goal of 100% PM Completion, but that’s not really a goal is it? It’s a requirement, and if you have to set your goals to meet regulatory requirements that’s like saying “My goal this year is to do my job.” You’re not really stretching yourself. I’m not saying there is anything wrong with corporate or departmental goals, but look at the Oxford definition above – where is the ambition in meeting regulatory requirements? So, when considering departmental goals, which aren’t necessarily super fun things to do, consider those things outside of what you are expected to accomplish. A goal is something that should force growth, personally and professionally, and in the case of departmental goals, this should reflect team growth and cohesion. But, departmental goals are not the focus of this article – that was free for nothin’. That brings us to our second type of goal – individual or personal. As I reflect back on my interaction with personal goals over the years, most often they were assigned by leadership for the express purpose of meeting some corporate or regulatory requirement. I had no vested interest in completing, let alone exceeding, the goal other than to check the box before the end of the year. Now before all the hate mail starts, I’m in leadership at my organization and am just as guilty as the next leader in making up a few last-minute goals to assign to every single team member – and I mean that every member received exactly the same goal. This of course is fruitless, turning what could be a good goal for an individual into a nuisance departmental goal that may have no applicability to the rest of the team. Here is where we made a change. For starters an individual goal should be individualized – developed specifically for each individual member of the team – one per customer. I can hear it now – “Hey, wait, I have 18 technicians to write on, that’s gonna take a lot of time.” – Yes, yes, it is, but are you truly interested in the real growth and maturity of your individual team members? Truth be told, it took a couple of months to get to the point of writing down a goal for the coming year, but once I explain what took place, I hope you will be willing to invest the time. Each technician should develop an individual goal that is impactful to shop operations. The impact should be measurable in a cost or labor hour savings, but the result should directly affect the time it takes to accomplish a task or an improvement in patient safety. Once determined, the goal must be approved by the department supervisor or director. In addition to the documentation above there should be an accompanying policy/process/flowchart/visual aid that will be used to communicate the win to the rest of the team. If your goal requires physical signage and/or the procurement reassignment of tools/equipment/parts or material, that will need to be documented as well. Once completed, you will be required to present your win to the team. Throughout the process, leadership will be available to provide guidance on the use of the tools above or offer suggestion in navigating roadblocks. As we progress through the year, there will be one-on-one sessions to gauge your progression toward goal and to offer feedback. You will be expected to allocate 1-2 hours per week toward accomplishing your goal. This gives you between 36 and 72 hours to invest in completing your goal. If you have a particularly in-depth goal, additional time can be allocated, but the end result of this task should demonstrate that you spent at least 36 hours on it (i.e. quality of work is a factor). This goal will represent 25% of your annual evaluation. The first thing many will key in on is the use of Lean/Six Sigma Process Improvement Tools. This element was incorporated to support our organization’s journey to a Lean Healthcare environment. Over the past couple of years there have been several training events that brought some familiarity to some tools, and simply introduced others, but we thought this to be a great opportunity to incorporate these into the team’s daily activity and provide for individual growth. The second thing some will notice is that we are not telling the team what to focus on, but instead allowing them the autonomy to impact something that they have a personal interest in. What’s great about it is that we don’t really care what it is, because, according to the established criteria, we will either save money or time or have a safer environment when they are done. By allowing the individual to pick their goal, you end up with automatic buy-in and an accompanying level of pride in knowing that they are directly responsible for the success or failure. So, we issued the directive, and it being a new experience for the team, there were some initial grumblings, but not near as much as we expected. Once we affirmed that we as a leadership team are fully engaged in their success and are relying on them to pick a goal that they want to accomplish as opposed to force feeding some inconsequential departmental goal, the ideas started to flow. About three weeks after dropping the initial bombshell, we followed up with a meeting invite to each individual team member. This would be their opportunity to tell us the direction they are trying to go, and our opportunity to refine their ideas, however slightly, to meet the program’s objective. Inevitably, we had a team member or two that, as opposed to shooting for the moon, chose to shoot for a low hanging branch, but after a quick recalibration, everyone was headed in the right direction. We were completely amazed at the level of sophistication and complexity that some of these projects aspired to. For the most part, during the initial interviews, all that was needed was a little push to have the team member develop a plan to sustain the gains that they projected – other than that, most were well thought out and very impactful to overall operations. Over the remaining few weeks, another email was sent out, this time containing the format in which we needed them to be entered into their performance evaluation. Quite simply: title, description and expected outcome. Just a short synopsis of their plan and how we would know if they accomplished it. Once received, we simply cut and pasted them into their goals for the coming year. They will be evaluated on what they said they were going to accomplish. They own the process and the success when accomplished. Description: Establish new metrics with which to illustrate clinical engineering’s expectations and service vendors’ effort to meet these expectations. Our desired goal is to clearly communicate and illustrate our service expectations for all suppliers regarding access to service resources associated with equipment purchased by the organization. Expected Outcome: This will be a long-term metric that should provide clear visibility to the performance of vendors against their own stated deliverables as well as each other. This has the potential to dramatically increase the effectiveness of clinical engineering as well as the entire in-house clinical engineering industry and future purchase negotiations. Description: Automation of the collection of clinical alarms data would eliminate the human error factors as well as speed up the process of creating such reports. There are many different processes to automate, but this project will focus on automating the transfer of data from the 10 server monthly reports into one main spreadsheet. Expected Outcome: Time to complete quarterly reporting should be reduced by 90% to 2 hours per quarter. Seventy-two labor hours saved per year plus this eliminates human error to almost zero. This is an ambitious goal but should be achievable if as much of the process is automated as possible. The only quarterly changes to the code would be adding sections for each new file (10 per month, 30 per quarter). Description: Develop and implement the process around the management of imaging installation projects. This is to include all aspects of installation to include: pre-procurement, PO & point of sale contracts, deinstallation & trade-in management, construction & design, delivery, vendor management, install, final inspection and clinical acceptance. Expected Outcome: Provide for the more efficient management of equipment installation that results in better use of resources, cost avoidance associated with rework and missteps, and a decrease in the overall time invested in the installation process. The intention of this article is not to toot the horn of my own awesome clinical engineering team, but to hopefully encourage leaders out there to unleash the potential that may be sitting dormant in a technician among your own awesome teams. There are many different industries out there with varying degrees of innovation and motivation among their employee base, but over the past couple of years I have been privy to learn the immense potential of a biomedical equipment technician. Unfortunately, they can sometimes be stifled by leadership. Not purposefully but stifled none-the-less. As a leader, if you truly care about the success of your team both individually and corporately, give them the opportunity to shine on their own terms every so often. Good luck! 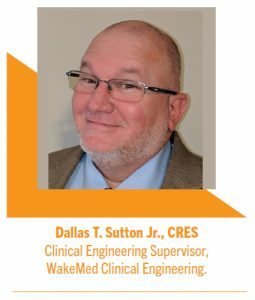 Dallas T. Sutton Jr., CRES, is a clinical engineering supervisor for WakeMed Clinical Engineering.